Color temperature refers to the light at different energies, perceived by the human eye color change. 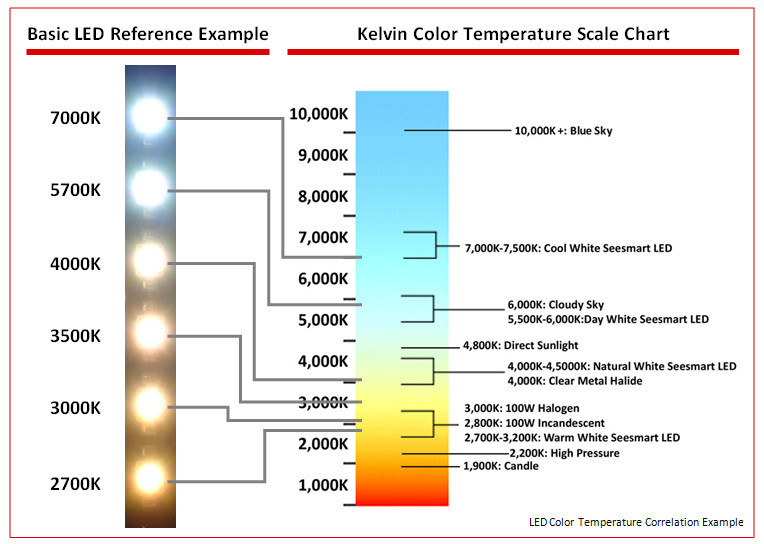 On the color temperature calculation is based KELvin units blackbody radiation of 0 ° Kelvin = -273 Celsius ° C as the starting point for the calculation. The blackbody heating, as the energy increases, it will enter the field of visible light, for example, in the 2800 ° K, the same shade and bulb, we would say that the bulb color temperature is 2800 ° K. color temperature change in the visible light range by High color temperature is low color orange-red -> white -> blue. 1. In high latitudes, higher color temperature, bluish color seen. 2. At low latitudes, the color temperature is low, saw reddish color. 3. in the day, the color temperature also changes when the sun dipped, energy is (clouds, air) to absorb more, so the lower the color temperature. When direct sunlight, less energy is absorbed, so the higher color temperature. 4. Windows sRGB color model is based on 6500 ° K color temperature as the standard, in order to express the D65. 5. The color temperature early in the morning at about 4400 ° K.
6. alpine color temperature of about 6000 ° K.
Color temperature is a physical phenomenon that the metal is heated to a certain temperature, it is showing a colored visible light. This light changes as the temperature rises, the temperature of this light source is called the color temperature of the light source. In the light emitting but also the release of heat, different heat generated by the different sources of ignition, light emitted there different color changes. Because of this change, each of the color light sources emit a specific wavelength, and is formed with the color of the illuminated object itself mixed colors. The color value of the light is measured as a temperature, because when an object, such as a metal sheet by heating when it is heated with the combustion temperature rises, emitted from red to yellow as well as white light If burning does not appear sheet metal chemical or physical change, it even emits blue light. Not degree light source color temperature combustion temperature, which is an indication of the color produced by light source, the color temperature value candles emit yellow-red light is 2000K, it does not mean that the candle burns can reach a temperature of 2000 ° F.
In fact, color temperature, actually refers to the spectral composition of the light source. For example, sunny sunshine around noon in the visual experience is white, in fact, is a mixture of many monochromatic made. Sooner or later, at different times, or overcast weather situation changes, the proportion of light in shade is changing, that is, the spectral composition of the light source changes. If the spectral composition of light shortwave percentage increase, reducing the proportion of long-wave light, bluish light, the color temperature to rise; on the contrary, the proportion of the long-wave spectral components increase, reduce the proportion of short-wave light, red light handy, the color temperature is low. Thus photography, color temperature level, simply means that the red light source contained in the blue in different proportions, regardless of the actual temperature. Color temperature expressed in degrees Kelvin (K). The method used to calculate the light color component is the late 19th century by the British physicist Lord Kelvin founded, he worked out a set of color temperature calculation method, and the standard specific assay is based to a blackbody radiator issued out of the wavelength. Kelvin thought, suppose a black object that can absorb all the heat will fall on it, and no losses, while the ability to generate heat all the energy released in the form of "light", then it will suffer due to heat the level and become a different color. For example, when the black body by the heat equivalent to 500-550 degrees Celsius, it will become dark red to reach 1050 a 1150 degrees Celsius, it becomes yellow ...... Thus, the color components of the light source with the blackbody temperature suffered heat Corresponding. Except that the color temperature is Kelvin (K) color temperature expressed in units, rather than the Celsius temperature units. Blacksmith process, the black iron in the furnace temperature gradually turns red, this is the best example of blackbody theory. When a black body by the heat so that it can release the full spectrum of visible light waves, it becomes white, usually we used tungsten filament inside the bulb is equivalent to the blackbody. Color temperature calculation is based on the above principle, use. K to represent the color temperature of the light emitted by heated tungsten filament. According to this principle, any light color temperature is equivalent to the above blackbody emit the same color by "temperature." Color is actually a psychological effect on the physical, all the color impression generated is due to intermittent spectral response in the eye, so the color temperature is used to represent the color of the visual impression.